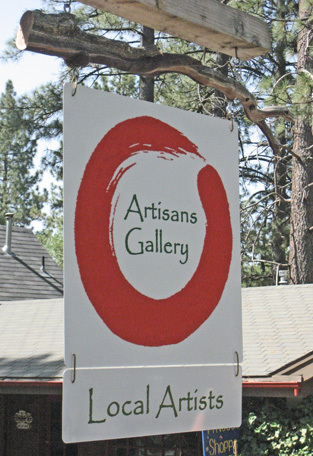 This month marked the closing of Artisans Gallery. 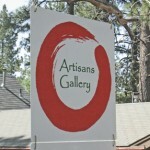 It was the largest in Idyllwild, showcasing the work of more than 80 local and regional artists. Some of their work in painting, sculpture, pottery, jewelry, photography and fabric art can still be seen at www.idyllwildartisans.com. Amanda sat among the clutter that comes after all the paintings and sculptures have been taken from the walls, tables and stands. Her neighbors in Oakwood Village, Bob Cox of The Vintage Shoppe and Frank Bruynbroek of Oh My Dog Gallery, were there to keep up her spirits and take “extras” for their own shops. 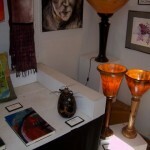 George, from the Acorn Gallery, walked away with three pedestals and a display rack. The Artisans Gallery closing came on the heels of a death in the family, and months of supplementing the gallery rent with her own income. She’s not wasting time dwelling on the past. An accomplished jewelry designer, Amanda plans to spend next spring in Nantucket, near Cape Cod. She received an artist residency at the Nantucket Island School of Design and Art, after submitting a portfolio of her work. The Nantucket work study lasts five months, but Amanda will likely stay only three. There, she plans to do a large installation, a “crazy quilt” made up of beads and stones. Amanda plans to make a crazy quilt of stones from the Cape Cod area, and glass seed beads. However, it’s not going to be an easy feat logistically. The beads and the thread have to be as strong as the stones that they’re covering and bonded to, or it won’t work. Last summer, Amanda had another art residency in North Carolina. There, she spent two months creating a beaded sack around an 11-pound rock. For her Nantucket crazy quilt, Amanda will only partially cover the stones with beads. “I love to show the rocks because they’re natural objects,” she said. Amanda's beaded condom over a Jeffrey Pine Cone. Photo courtesy Artisans Gallery. 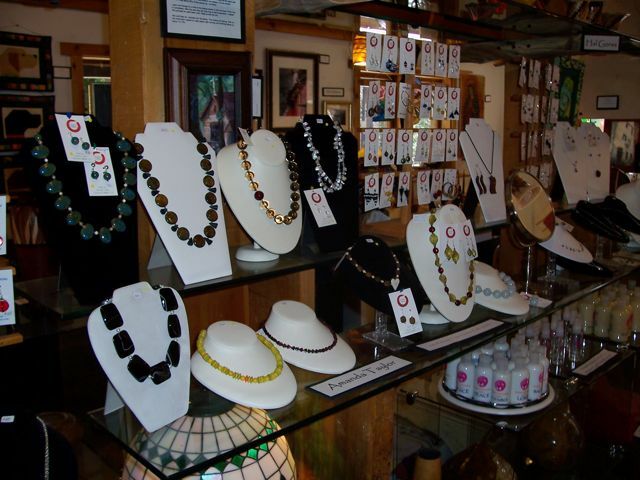 On her personal web site, beadbybeadbybead.com, Amanda has a “Mountain Series” of sculptures from Idyllwild in which she covers acorns, Manzanita wood pieces and pine cones with beads. 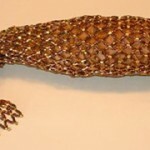 The “Pine Cone Condom” shows a glistening and intricate beaded covering for a Jeffrey Pine Cone. 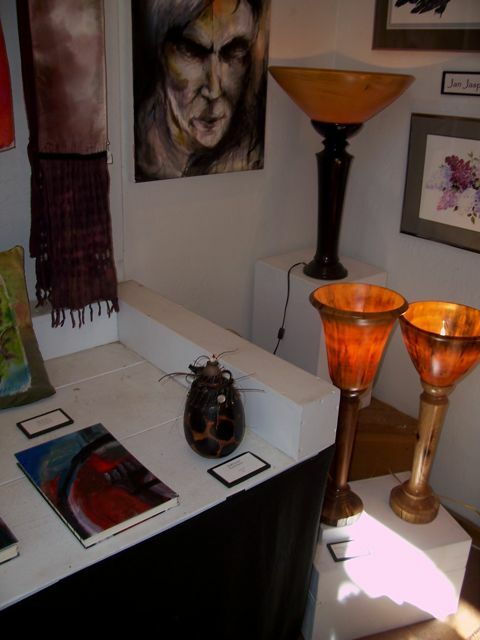 Although Artisans Gallery lasted four years, Amanda hasn’t given up the idea of having another art gallery in the future. 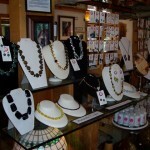 For more samples of Amanda’s jewelry and sculptures, visit www.beadbybeadbybead.com. This entry was posted on Saturday, October 23rd, 2010 at 4:22 pm and is filed under Art. You can follow any responses to this entry through the RSS 2.0 feed. Both comments and pings are currently closed.